Hae Joo witness what bulter park did at the cliff and managed to stop the tragedy before her father get push into the sea. Alarmed, bulter park panickly denied doing anything when Hae Joo asked him what he is doing with the hands. Soon, the debt collectors came and demanded for payment. They were given a week to clear their debts. Hae Joo father (Chun Hong Chul) tried to know more about President Jang through Yoon Jeong Woo. Bulter park came with a bag of money to look for Hong Chul. He will help to clear his debt but the only condition is to leave Ulsan immediately. Hong Chul hesistated but he decided not to take the money and even revealed what he had discovered. Bulter park intended to use a rock to hit Hong Chul, however, he changed his mind and arranged to let Hong Chul meet with his madam. Chang Hee saw Kang Sang solving mathematical formula on the whiteboard and he was amazed. He asked Kang Sang why is he alway the last in school since he is able to solve the mathematical problems. To which, Kang San replied that the school work is not interesting as compared to this. Chang Hee stayed behind and analyse the mathematical format which Kang San could not solve. In Hwa waited for Kang San and gave him the book - Fermat's last Theorem. Hae Joo was wiping the floor when she found a hand-knit yellow baby sweater and she showed it to her mother who insisted that she threw that away. Bulter Park seem to plot something against Hong Chul as he drove a lorry to a deserted place and changed the number plate of the lorry. 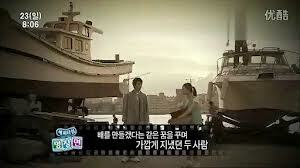 On the other hand, Chang Hee met Hae Joo while riding a bicycle and he offered to give her a ride home. Hae Joo packed some stream bread for her father and Chang Hee again offered her a ride to her father workplace. Hae Joo offered a stream bread to Chang Hee on the way and they accidentally fell on the ground and gazed into each other's eyes. Unknowingly, bulter park drove the lorry and passed them by. Chang Hee left the bicycle for Hae Joo and complimented her for being nice and bright to which Hae Joo heart beat faster. Hong Chul drove the boat with Hae Joo and spend precious moments with each other and hinted that they could be separated from each other. Bong Hee, Jeong Woo and Guem Hee met each other at Hak Soo tomb and paid their respect. Jeong Woo was not able to forgive Guem Hee for marrying President Jang. President Jang discreetly met an officer and discussed about shipbuilding. They reached an unethical dealing and planned to plot again President Kang whom he holds a grudge to. The chemical results of the plantation came out and he as what Bong Hee suspected, somebody poisoned the to trees at the pear orchard. They secretly laid in ambushed and true enough, they discovered the people poisoning the land using chemicals. Bong Hee gave chase to the culprits and Jeong Woo accidentally groped her as they fall together. Butler park waited at the meeting place and was looking for an opportunity to run Hong Chul over with his lorry. It was 9 pm and Butler park did not show up at the ocean industrial. Hong Chul walked on the lonely street and Butler Park braced himself as he accelerated with high speed and drove towards him. However, Hae Joo cut his path and in a bid to rescue Hae Joo Hong Chul was knocked over by the lorry. Hong Chul was rushed to the hospital and the doctor told the family to be prepared for the worst. Butler park was punishing himself by hitting his forehead against the rock and when he went home, Chang Hee was shocked and thought that he was beaten by President Jang. President Jang ordered butler park to the study room and before he could get anything out of him, In Hwa went into the room and said that Hae Joo dad was involved in an car accident. Butler Park drove Guem Hee, Chang Hee and In Hwa to the hospital and was distracted on the way to the hospital. Hong Chul woke up and apologized to Hae Joo for not giving her a happy life. He was about to tell her who is her biological mother when In Hwa mum stepped into the room and he pointed to her direction. Sad to know that Hae Joo dad (Hong Chul) is going to die. I understand that this is part of the plot to get the story going but i was pretty sad about that scene. How is Hae Joo going to deal with this heart break and how will her family members treat her from now onwards? Are they going to blame Hae Joo for what happened? which is most likely. Anyway, the childhood romance between Hae Joo and Chang Hee was sweet. The child actors and actresses were pretty good in acting those scenes where they had a crush on each other. Kang San remains an interesting character which i was looking forward to in the later episodes. Butler Park is really a coward and i don't understand his motive for all these. I understand that he wanted to protect Chang Hee and was afraid of President Jang but he went to the extend of killing someone which makes him a murder. Anyway, i believed Hae Joo yellow sweater will be used as an evidence for identification purposes or stir out suspicious of the missing child. Lastly, In Hwa was kind enough to visit Hae Joo father at the hospital and i find her much better than her bother. There was a mixture of light hearted moments and dramatic moments in this episode. Overall, I really look forward to the story unfolding itself with each episode.